This is it. This is what you’ve been looking for since you started your SEO journey. Forget about all SEO tools for a second here. All you are going to need and want after reading this article is one thing – SERPed, the ultimate all-in one SEO solution. By the end of this article you will save up on hundreds of dollars on monthly subscripions by simply subscribing to a single SEO service. I know, a very strong statement but give me the chance to back those words up. SERPed features preview – what tools does SERPed have in its arsenal? What can you do with each of them in a few words? SERPed ultimate tutorial – an in-depth look at all of the tools that SERPed has to offer with real world examples including info on the daily and monthly limits. Other SERPed tools – aside from all of the tools provided by SERPed, you also have a bunch of miscellaneous functionality that is extremely useful. SERPed honest review – our own genuine opinion of this SEO tool. Simply put, SERPed is a suite of almost all SEO tools you will ever need to create, rank, and manage websites of all kinds. Now, there’s currently a total of 42 SEO tools at your disposal once you purchase SERPed and that list is growing. Right? All that for less than $80 per month? Keyword Research – content that ranks starts with great keywords research and these tools are the some of the best on the market. Ultimate Research – get thousands of keyword ideas from seed keywords and display monthly search volumes, potential revenues, etc. If you are looking to find new profitable niches and target keywords in them, this is the tool you need. What Ranks Where – enter your site details and some other information to see what keywords that site ranks for and where. Keyword Analyzer – if you want to know how and what for your competition ranks, this is the tool you want to use. Long Tail Keywords – long tail keywords have been the gold nuggets for many people for a long time and this tool will help you find them. Domain Research – know yours or your clients’/competitiors’ domain and URL metrics. Site Explorer – shows in-depth data about domains/URLs such as Moz PA/DA, Ahrefs metrics, Majestic TF & CF, domain age, index status, etc. 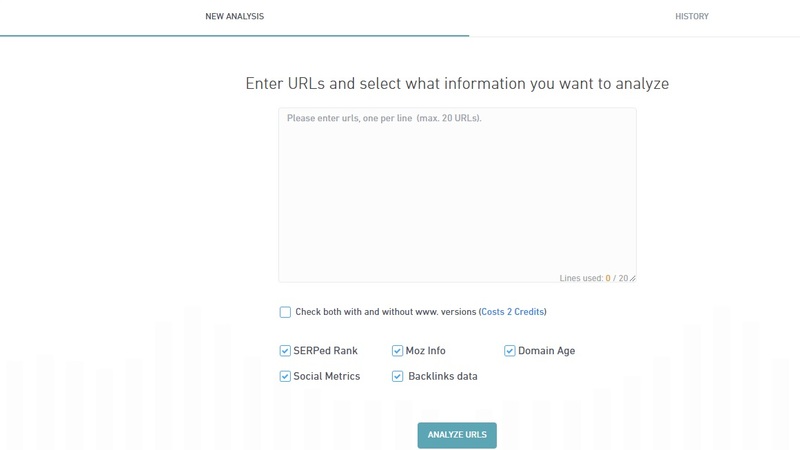 Bulk URL Analyzer – same as the Site Explorer tool however you can analyze multiple URLs at once. Backlinks Explorer – analyze the off-page portfolio of any domain you want. Domain Finding – finding high quality domains for your PBN has never ever been easier and cheaper. Aged Domain Finder – find expired domains in any niche you want in a matter of minutes. All with relevant metrics from Moz, Majestic, etc. Top Expiring Domains – shows you the best expiring domains within the next 72 hours. It takes data from domain auction sites such as NameJet, SnapNames, GoDaddy, Flippa, DynaDot, etc. Expired Scraper – if you want a custom expired domains scraper that allows you to do whatever you want with it, then this is the tool you need. 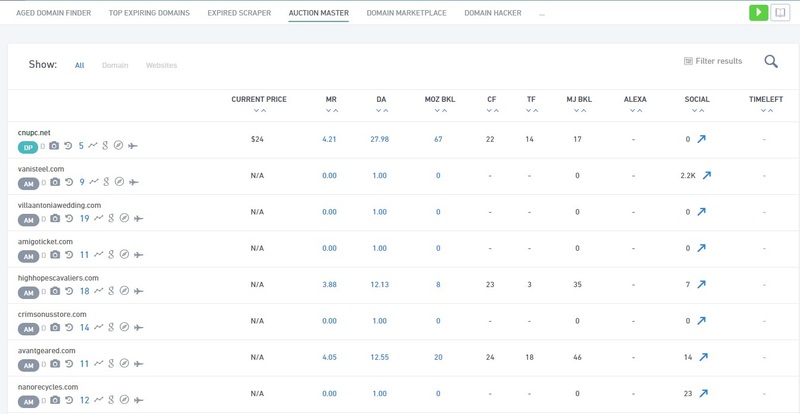 Auction Master – allows you to scan the top domain auction sites for domains you might be interested in buying. 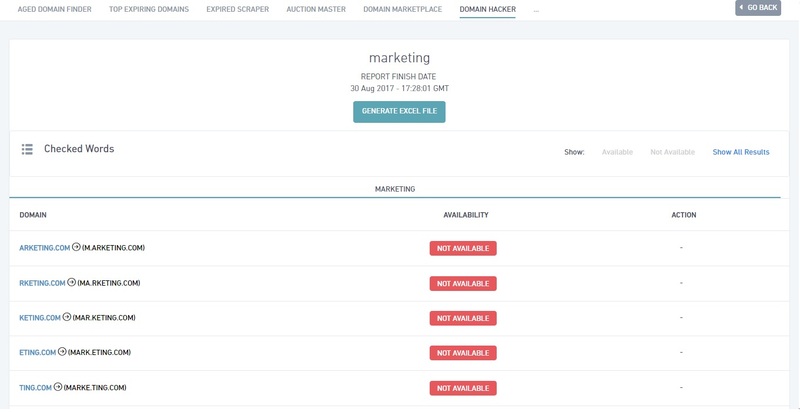 Domain Marketplace – still under development but when finished, you will be able to purchase domains directly from SERPed. Domain Hacker – this tool helps you find available TLDs based on your keywords. If the .com for your domain name is taken, don’t worry, use this tool to find viable alternatives. Site Management – manage all of your and your clients’ websites. Site Manager – add and fully manage websites. This includes backlinks portfolio, notes, tasks, index status on Google, metrics such as TF and CF, social signals, internal backlinks profile, etc. Backlinks Manager – know important info about the top 50+ backlinks for your websites. This includes things like status (live or not), index status, Moz metrics, anchors profile, etc. Web Analytics – allows you to track the traffic of your websites. Especially useful if you don’t want to use GA for whatever reason. Uptime Monitor – monitor the uptime and load times of your websites including automatic email notifications for websites that are down. Cashflow Manager – track the finances of your websites – expenses, income, assets, etc. Site Backups – automatically backup your websites to Amazon S3 servers. Done For You – community work done for you by SERPed. Social Exchanger – request tasks to achieve certain goals by collaborating with other SERPed members. Pro Monthly Content – if you need high quality content, then look no further. Rank Tracking – track the rankings of your or your clients’ websites. Local Tracking – track the rankings of a certain website for a certain keyword in certain cities. Global Tracking – track the rankings of a certain website for certain keywords in countries of your choice. Instant Check – instantly check your rankings for specific keywords. 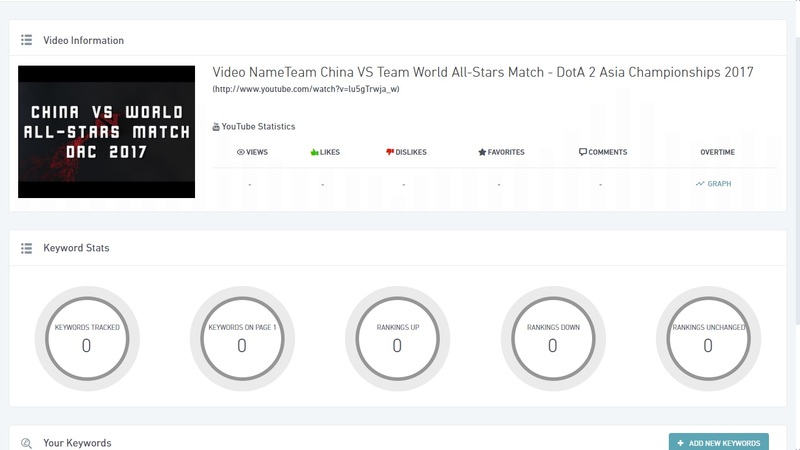 YouTube Tracker – track the rankings of YouTube videos. Amazon Tracker – track the rankings of Amazon pages. Client Acquisition – if you are doing SEO services, these tools will help you get new clients quickly and easily. Site Auditor Pro – create in-depth white-label SEO reports which you can use to drive new business. 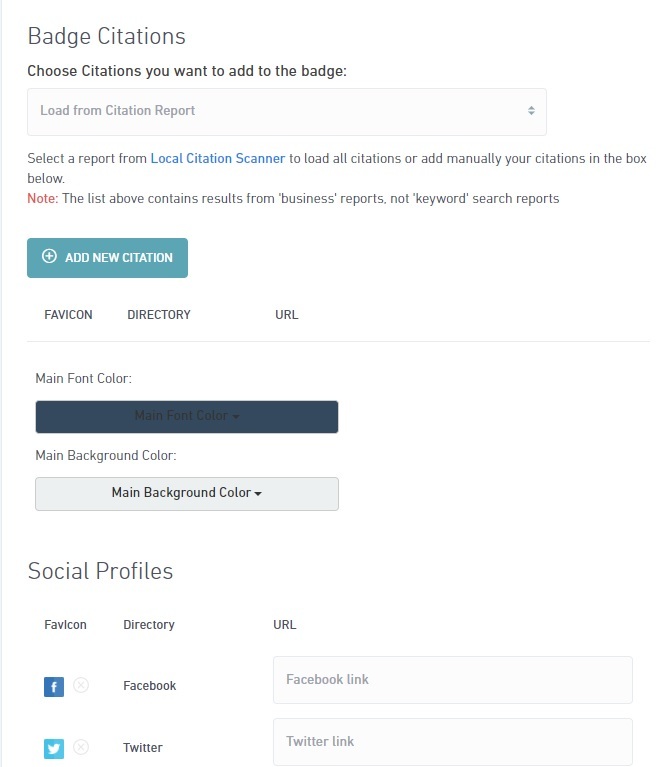 Citation Scanner – shows you hundreds of local citation opportunities. If local SEO is your target market, then this one will drive new customers day in day out. Review Badges – setup review functionality on your clients’ websites that can further boost their traffic. Mobile Prospector – check if a website is mobile friendly to further have an edge in bringing new clients to your business. Other Tools – miscellaneous tools that every SEO needs. 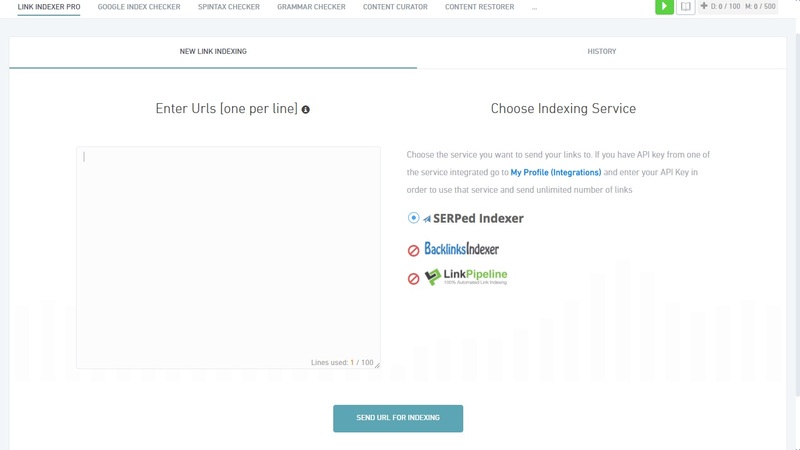 Link Indexer Pro – enter URLs that you want to index which will then be sent to an indexing service of your choice. Google Index Checker – check a set of URLs for their index status on Google. Spintax Checker – check your spintax for errors and generate a preview of said spintax. Grammar Checker – check your content for grammar mistakes and then test it against Copyscape for its uniqueness. Content Curator – generate content based on content scraped from the Internet. Can also add images, videos, etc. The tool can also spin the content for you and make sure it passes Copyscape. Content Restorer – use WayBackMachine to restore a previous version of an URL. WordPress Manager – manage all of your WordPress websites from a single interface. You can update WP, plugins, themes, etc. Inner Linking Profile – scrapes and analyzes the internal backlinks profile of a website. Reporting – generate beautiful reports for yourself or for your clients. System reports – you can create complete site reports, rankings reports, audit reports, keyword research reports, etc. Notifications & Alerts – setup notifications and alerts with specific triggers to even further automate your work. Those are all of the tools and their functionality in a nutshell that SERPed currently provides to its customers. Again, that is quite a lot if you ask me as this set of tools, if bought separately, can probably cost you upwards of $1,000 per month, and here you have it available for just $79. Now, you already have an idea of what every tool can do so let’s go through each of them again but this time look at it in-depth and with a real life example so you can see just how powerful SERPed really is. Now, before we start testing each SERPed tool, I just want to note that most of them have some form of daily/monthly limits which I will mention at the end of each tool review but keep in mind that you can easily purchase more credits if you need them. However, in most cases, the default ones will be more than enough to cover your needs. Also, every tool has a dedicated wiki page plus a video tutorial for those who prefer visuals over plain text. Now, I will separate the tools by categories just like I did in the previous section of this article so it’s easy for anyone to find the guide for a specific tool they want to use. Okay, let’s begin. Everyone who has ever ranked anything on search engines knows that the process of ranking is much easier when you have done a solid keyword research prior to writing the content of the page. So, SERPed has equiped its customers with all the keyword research tools they will ever need. Here’s an in-depth look at each of them. If you are looking to delve into a new niche or you just want to get some new keyword ideas based on seed keywords, this is the tool you want to use. 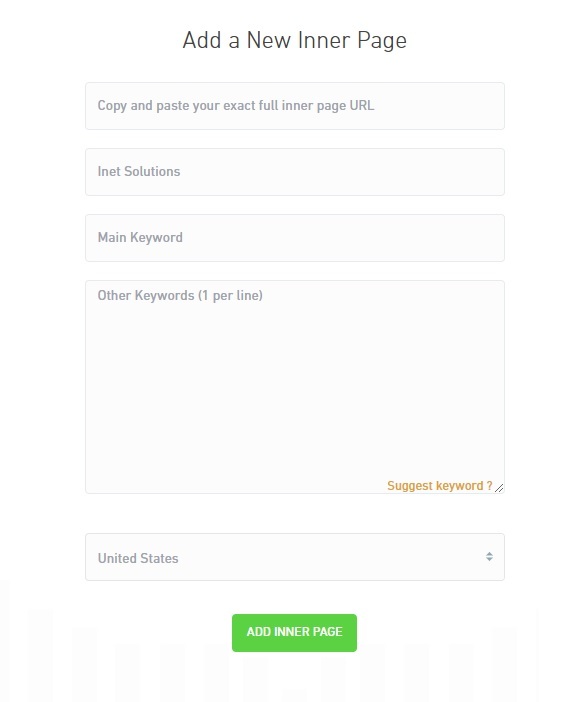 Right off the bat, you have a beautiful search form that allows you to enter one or more keywords which will be the seed keywords the tool will use to generate keyword ideas. 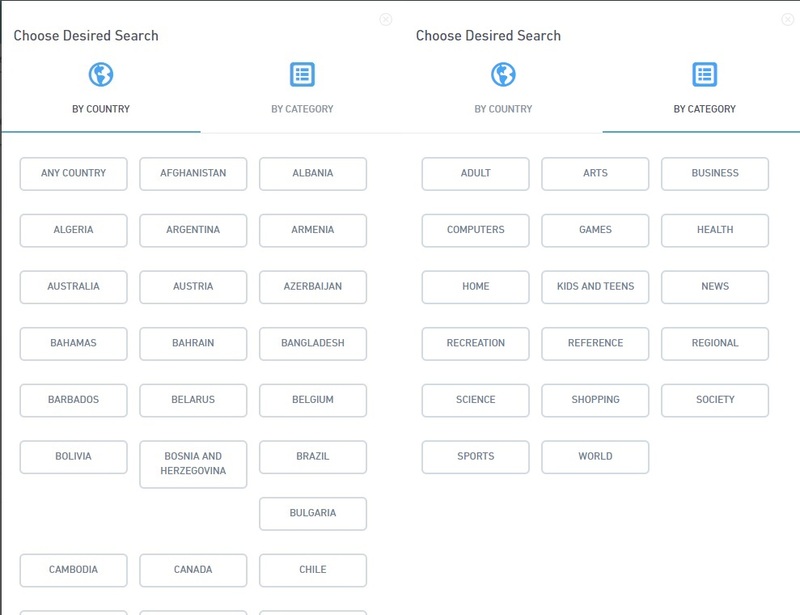 As you can see, you can also filter the results out by country, language, state, and even city. As you can see, you are provided with detailed information about each keyword including monthly searches (no longer easily available via Google AdWords like in the past), CPC, estimated revenue, etc. Add to project – allows you to add this list of keywords to a pre-existing project. Show only important – if you have previously marked keywords as important, then only they will be shown if you use this option. Export To .PDF – you can brand your PDF exports with company name, address, and logo by creating a company profile which we will cover later on in this tutorial. Check for Related Keyword Domains – checks for available domains (on Namecheap) that include the keyword. Get Long Tail Keywords – redirects you to the “Long Tail Keywords” tool to get long-tail keyword ideas for the selected keyword. Search Broad – performs a broad Google search for the selected keyword. Revenue Calculator – displays detailed estimations of monthly searches, CTR, monthly visitors, conversion rate, total revenue, AdSense revenue, etc, for the selected keyword. 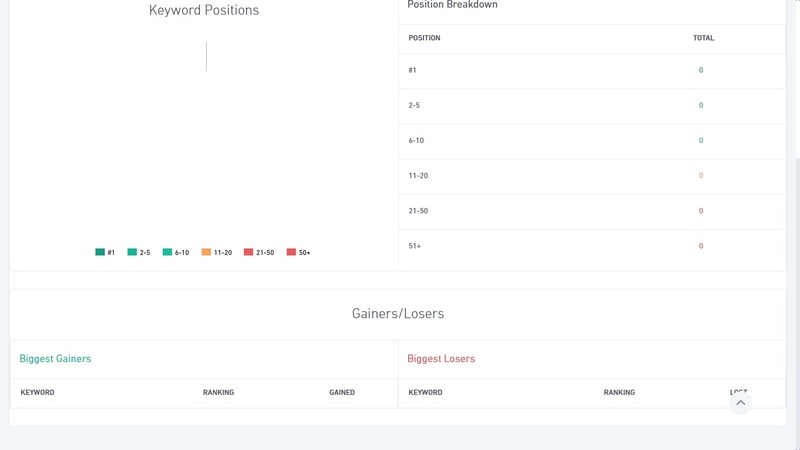 Keyword Analyzer – analyzes the selected keyword and shows keyword difficulty score, detailed info about the keyword, the top 10 pages that rank for that keyword including detailed metrics about each page, a Google Trend graph, related searches, and pretty much everything else you need to know in order to beat the competition for that keyword. Of course, all of your results are kept in the “History” tab of the “Ultimate Research” tool if you ever need to check on them again or re-execute the same search. And that’s it pretty much for this amazing and easy-to-use keyword research tool. Daily limit is 15 searches. Monthly limit is 100 searches. Monthly limit is 300 searches. I think it’s pretty self-explanatory what this tool does. It basically shows you the keywords that a certain website is ranking for and all it requires is the URL of the website. As you can see, the tool, very accurately, shows you where your website ranks, what keyword it is ranking for, detailed stats about both the keyword and the URL, including a link to a Google Trends graph. The three dots menu simply allows you to export the results to a PDF or a CSV file. And again, the “History” tab of the tool records all of your previous checks in case you ever need to use them again. And that’s pretty much all there is to this SERPed tool. Monthly limit is 80 searches. Monthly limit is 200 searches. 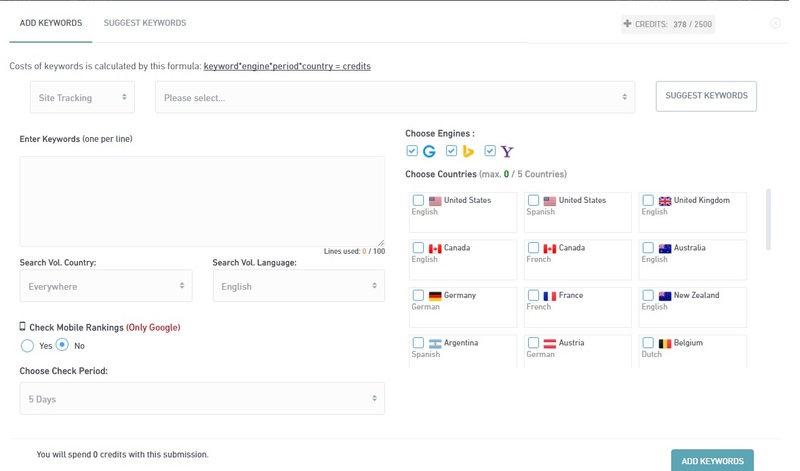 If you are looking to get in-depth details about a specific keyword and the competition for that keyword, then the “Keyword Analyzer” tool is all you need. As you can see, all you have to do is enter a keyword, choose the Google database you want the tool to research, and enter a URL you want to compare with the top 10 URLs ranking for the keyword. Then simply click the button and wait for the tool to generate the results. Total number of outbound links. Is the keyword present in title. Is the keyword present in meta description. Is the keyword present in the meta keywords tag. Is the keyword present in the header tag. Below the metrics for your URL, which are at the bottom of the above screenshot, you can also see a Google Trends graph for the keyword as well as relevant searches that appear in Google. Again, the tool has a “History” tab where all of your previous keyword analyses are stored. And that’s basically all there is to the “Keyword Analyzer” tool. Daily limit is 20 searches. Monthly limit is 500 searches. This tool is similar to the “Ultimate Research” tool with the only difference that it will look for long-tail keywords. Just enter your seed keyword, choose the platform(s) you want for the research, and click the big blue button. As you can see, you get all the metrics you need, including a related searches option that shows you metrics about the keywords the people also search for when they search for a certain long tail keyword, related domains which will redirect you to Namecheap and search for available domains relevant to a certain keyword, and the “Drill Down” column which allows you to add a certain keyword a project or to create a new project with that keyword added to it. 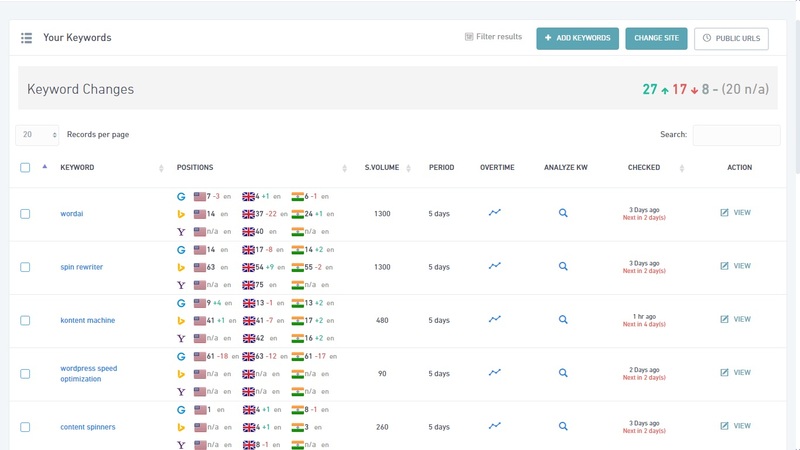 Projects in SERPed basically allow you to add a new website, add keywords to it, analyze the competition, and then track the progress towards outranking them for that #1 spot in the SERPs. Now, the three dots menu at the top right is identical to the one in the “Ultimate Research” tool as is the “Filter results” button. Again, the tool has a “History” tab where you can check all of your previous long tail keyword researches. And that’s pretty much all there is to the “Long Tail Keywords” tool. Daily limit is 10 searches. Monthly limit is 70 searches. 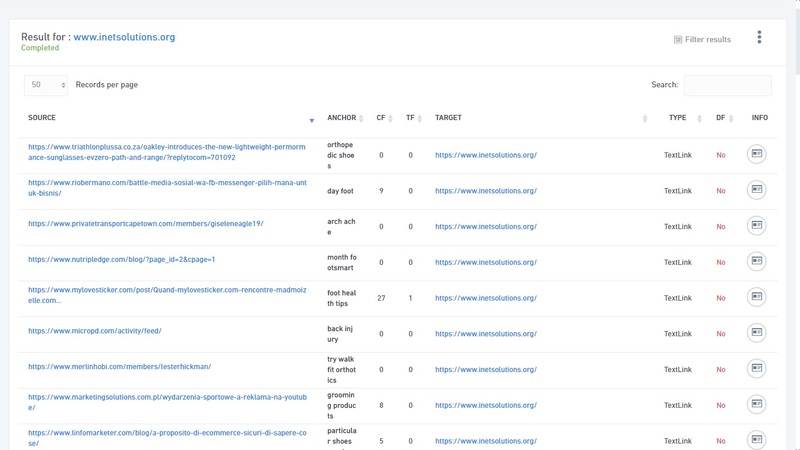 Following the Keyword Research section are two sets of tools that would help you quickly find, research and analyze domains. Whether you are a regular reader of our blog or are just interested in SERPed in particular, it is probably safe to assume that you have some familiarity with picking domains. Which also means you know that picking the right domain for the best price is no easy job. You need information on the right sellers, the domain history as well as its availability. This is where the Domain Research Tools come into play. There is a lot that “Site Explorer” brings to the table regarding domain analysis. The information this tool provides is actually quite substantial: everything from PageRank, age, and indexing, to summarized data from other popular SEO tools like Moz and Majestic. The landing page itself is quite slick, providing one tab for new searches and a second one for reviewing and reusing your search history. What is interesting to note here is that there is an option to look for either the “http://” or “http://www”. version of the website. Google treats those differently and consequently ranks them differently, so it might be useful to know which version is stronger. Details about these differences come up when the tool itself is kicked off. Here on the main screen you can see differences in metrics for both a domain with and without “www”. The information on the Overview tab is pretty straightforward, with charts and columns clearly labeled and indicating the meaning of a particular value. If you need more details on a category, you can navigate the bar on the left and choose one of the many tabs there. On these tabs you can view all the backlinks to the searched domain name, the age of those backlinks and the anchor text, charts and history of the domain, and many, many more. This is the second tool at your disposal under the Domain Research Tools. Similarly to the “Site Explorer” tool, it provides key data including the PageRank, domain age, Alexa Rank, Moz rank, etc. The difference here is that you can input up to 20 URLs at once. Furthermore, unlike the “Site Explorer” tool, there’s a bunch more filters here before you have executed your search. At the search results page, you can switch between viewing all URLs combined or separate the ‘www’ versions from the ones without (provided you chose the option). 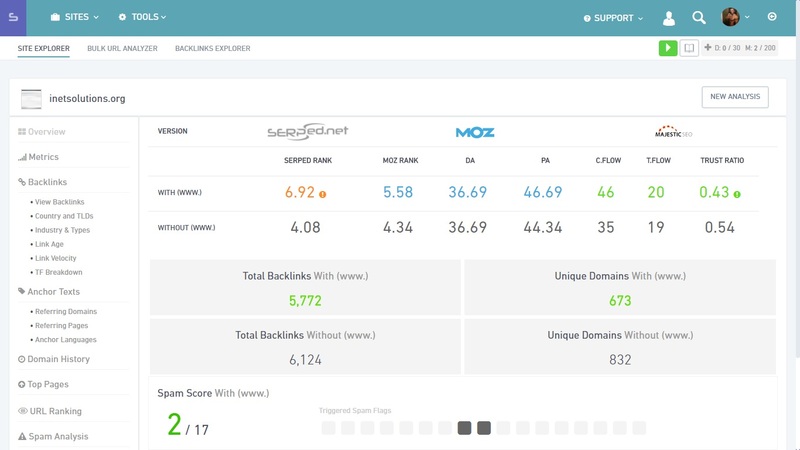 The report will include everything such as Page Rank, Age, the Alexa Rank, etc., and it is really handy to quickly analyze competition or compare old domains. As per usual, you also have a ‘History’ tab to quickly navigate through past queries. Daily limit is 5 searches. Monthly limit is 50 searches. The “Deep Backlinks Explorer” on the other hand allows you to check for age, Moz, Alexa Ranking and IP Address. 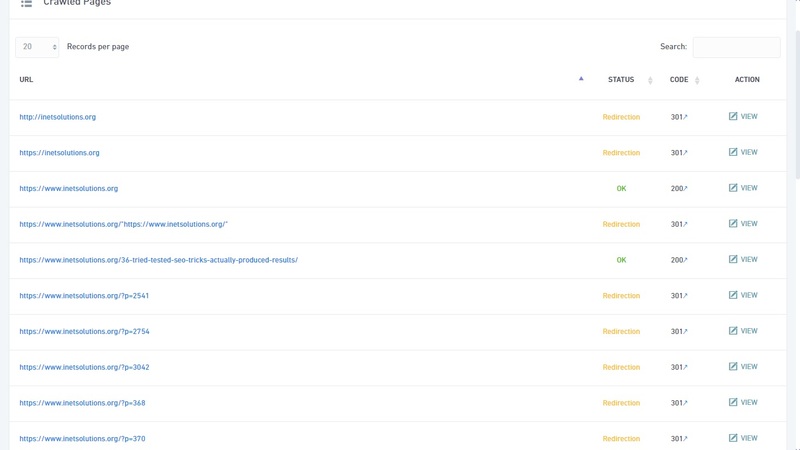 When the search loads fully, it will display a full breakdown of the backlinks, including the backlinks’ source. Just be warned; this option costs quite a bit more credits, with some features even being outright locked behind membership status. The “History” tab is also there and it also shows information on what the type of the search was. Daily limit is 30 fast searches. So, the first entry in the list of domain finding tools allows you to find, analyze and acquire the strongest domains up for sale. This tool is perfect not only for looking up info like age, strength, and pricing on old domains, but also helps you narrow down your results to precisely the niche you’re looking for. First off, you can enter a keyword to search the expiring domains for. ( On a side-note, you can also look for expired domains instead, or set the expiring date for the other ones) This is entirely optional, but keep in mind that using a keyword will narrow your results quite a bit. The same applies for the rest of the options here as well: you can enter all the specific attributes (age, price, MOZ rank, Domain Authority, etc.) 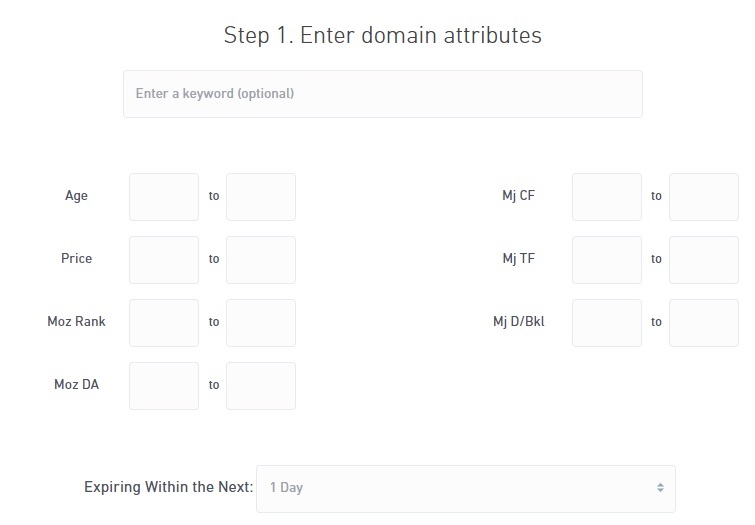 you want the domains to have, or you can choose to expand some of them to get more results. All the attributes here have a lot of mouse-over information to help you decide whether you want to include them in the search or not. Next up, you can look for specific TLDs. Here, you can just decide to go with all of them, or click “None” and manually include the ones you want. You also have the option to look for a Domain Source, but this is not really recommended, as it narrows the results by a whole lot. Finally, you can save the search preferences for later use, by imputing a template name under “Save Template.” Unlike previous tools, this one does not have a search history but instead provides you with the option to load past templates. After you click “Search,” you will get a long list of domains matching your criteria. Two redirects to SERPed’s tools: one for the “Site Explorer” tool and one for the “Backlinks Analyzer” tool. Both of these directly perform a query, using the chosen domain. Daily limit is 100 searches. Furthermore, if you wish to customize the results, you can apply a filter using specific preferences. 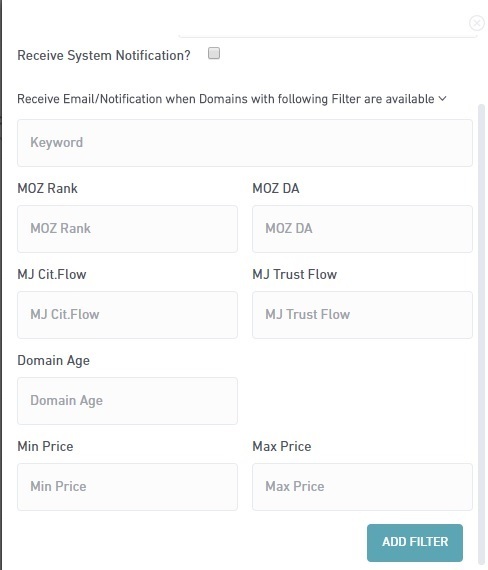 When you click the three dots at the top-left of the screen and then go to “Setup filter,” a pop-up window will appear, that will allow you to further filter results by Moz Rank, Moz DA, Page Rank, Domain Age, etc. To run the filter, just input all your desired criteria and click “Add filter.” You can also enter your e-mail in the field provided and tick the “Receive System Notification” box. This will send you an e-mail every time a domain with the matching criteria goes on sale. As with previous feature functionality, you will find tools to analyze each domain directly underneath it. There are no search limits on the “Top Expiring Domains” tool. The first field allows you to enter the precise domain name, provided you know it. If you don’t want to search for a specific domain, you can click the blue arrow button on the left. This will take you to a pop-up window with two filter options – country and category. 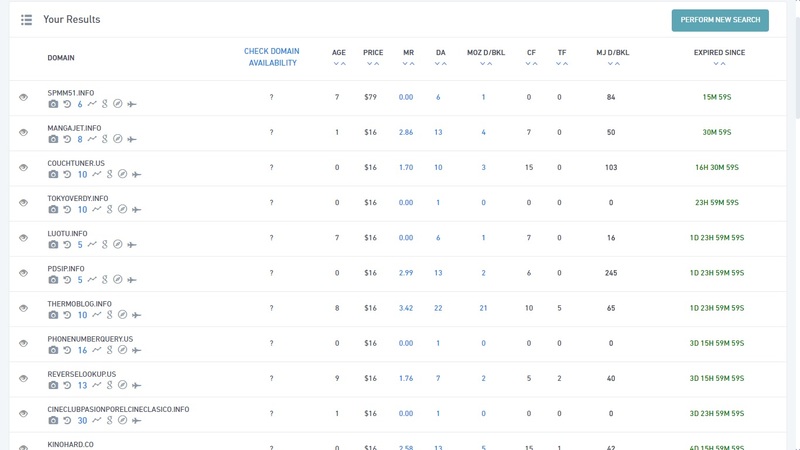 Going through these filters will show you the top website results for each category. Once you have selected the website, you can go ahead and click “Search this Domain.” The results might take a bit to load, but you will get a pop-up notification from the website, as well as a sound alert. The report itself looks a lot similar to the reports from the rest of the Domain Finding tools. All the functionality in the bar below each domain is there. You also have the same header with metrics that can help you sort through the results. One new feature you will notice is the “Action” column at the end. Clicking the Info button will show you where the backlink is from and which page it is linking to from the URL you had entered. Register, on the other hand, gives you a list of websites that can be used to register the domain. Finally, premium members can see a list of results bellow the filters bar on the home page. This feature provides a number of available expired domains from different member searches that were not registered. Similarly to the “Top Expiring Domains” tool, you can click the three dots on the right to set up a filter, and you can enter your e-mail for a system notification. The tool also has a history that allows you to go through previous searches and download a report. Daily limit is 3 searches. Monthly limit is 20 searches. The next tool is really straight forward. As you probably know, to find domains with good metrics, you need to go to different platforms, search for domains, then check their metrics one by one. Then, if you don’t find anything, you need to go through the process all over again the next day. 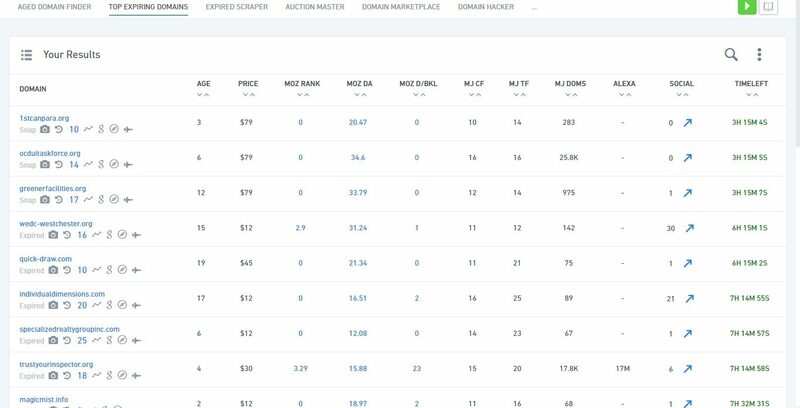 The “Auction Master” tool scans all major auction platforms for domains and sites for sale and presents them in a single, easy-to-use table. Clicking on the tool immediately brings you to the table with all the results. Clicking on any of those will redirect you the place you can purchase them from. Each domain has the analysis tools underneath them, and the header bar provides a convenient way to sort results. By default, the tool displays both domains and websites, but you can choose to see only one or the other. There are no search limits on the “Auction Master” tool. As of now, this tool is not yet functional. According to the team behind SERPed, it should be up and running pretty soon, but we can still go over its functionality. The main idea behind it is that it will be a place, where domain brokers would be able to post high-quality domains with great metrics for sale. It will function similarly to the rest of the “Domain Finder” tools, but it would save you a lot of time since the domains will be handpicked according to high metrics. We will have further information and screenshots of the tool, once it is fully operational. The second to last entry in the “Domain Finding” tools will help you find the best ‘hacked’ and related domains. Usually, it may seem that all the best domains have already been taken. While that may be the case, the “Domain Hacker” tool will help you make sure that you find whatever is left. And do remember this: there are always domains left. 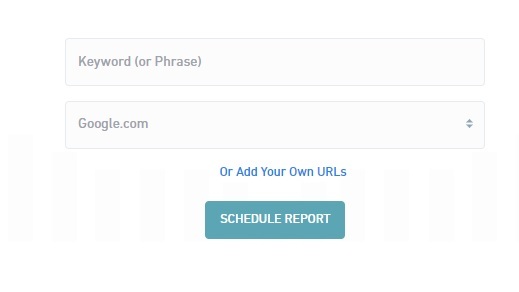 When you hit the “Que New Report” button, the tool will start scanning different TLDs. When done, you will get a site notification, and you can also follow the progress on the “History” tab. When you get the report, each of the keywords will be shown on a separate tab. In each tab, you can see different domain names and their availability, with there being a filter to sort by available/not available. You also get links to different retailers you can purchase the domain from. The “History” tab also contains all previous queries, and you have the option to export them to an Excel file. 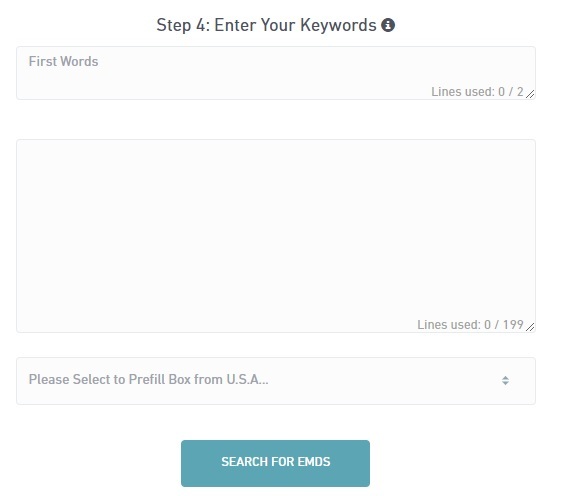 This final tool under the category makes finding EMDs (Exact Match Domains) really easy. The only real time-consuming task here is entering the parameters before you start the search, and even that is made extremely simplified and easily accessible. Let’s go over the parameter fields one by one. When you start the tool, the first thing you need to do is enter a project name, so you can reuse it later if you want to. Next up, pick the country you are targeting; keep in mind, you can only chose one at a time. Next up, select the desired domain extensions to search for. Sadly, there is no “Chose all/none” option here, so you will have to tick them manually. Finally, you can pick up to two keywords in the first box and up to 199 in the second box. ( as per usual, one entry per line ) In the case that you don’t want to enter locations, you can just use the “Prefill box” slide bellow. The report takes a while to load up, but that is understandable, since the scope of the search can be quite huge. When it’s done, you will get a notification in the website and you can re-visit the results anytime in the history tab. So, using the tools up until now, you have found the perfect domain for your new niche, or you have closely followed your competitors to see how well you are doing. With this next set of tools, you can now start to start building up that new network or solidifying the strength of your current one. As the name implies, this feature helps you manage your websites and links without much difficulty. There is quite a bit of useful information about your sites here, as well as nifty gadgets to ease your experience. Let’s now go over the creation of a new project. First off, when you click the “Create new project” button, you will be taken to this initialization page, where you get to name the project. If you are unsure what any of these mean, you can mouse-over for additional info. Alternatively, if you are having difficulty going through all of these steps, you can just click the “Or Use The Walkthrough Tutorial” hyperlink, which includes an illustrated video tutorial on how to use the tool. When done, click “Finish.” You can now go ahead and start managing the website from here. The first thing you will notice when you select “Manage Site,” is that you can add inner pages from your main website to the project. In the popup window (picture bellow) , paste the URL of your inner page, add your keywords, and select the project if necessary. You’ll be able to see all the statistics for this page and track its growth. You can also explore the backlinks to the site and export that to a .csv file. Finally, along with the statistics and graphs for your site that are provided in the first two options under “action,” you can also get a personalized “SEO Review.” This gives you a full SEO breakdown of your site, as well as recommendations for improvement. There are no search or project limits to the ‘Site Manager’ tool, but you can manage up to 25 sites for the premium subscription and 100 for the ultimate one. The Backlinks Manager tool is a rather simple one. With it, you can check the topmost 50 strongest backlinks to a given website. You can track information like the status of the backlinks, whether or not they are indexed, as well as data like Moz DA/PA, IP address diversification, and anchor profiles. It also comes with an auto-update option, so that you can fire it off with a particular website, then just come back and check the status. Upon starting the tool, you can either input the website you want to check manually or browse for it in the already created projects. Both options search for websites in the projects you have created with the “Site Manager” tool, so if you haven’t used it already, do that now. Once you have chosen a project, you can then select a site and an Inner Page, or you can choose to see all pages. The results will be shown in a clear table with link summaries. There is information on the link anchor, the target of the backlink, as well as some other useful metrics. A mouse over each link will give you a pop-up that gives more details so you can see if you need to take action. Monthly limit is 600 backlinks. This tool tracks and analyzes the traffic going to your chosen website. This is a great way to see if your site has been seeing growth lately, or whether you need to improve it to grow traffic and boost sales. Furthermore, unlike ‘google analytics,’ the “Web Analytics” tool uses multiple different domains to ensure nothing points back to you. Finally, you can also use to tool to track your competition and to always keep you informed about the situation in your niche. Choosing a website to track happens the same way as with the previous tool. Type in the website you want to track or select it from the “browse” option. All websites appear in a table like the one above. You will notice that there are no results currently. What you need to do in order to activate is click the icon under the “action” category, copy the tracking code and paste it in the code of your site. The tracking code must appear on every page that you want ‘Web Analytics’ to analyze. Alternatively, you may install the ‘WordPress Manager’ plugin and paste the tracking code in the ‘Web Analytics’ section of the plugin, so it is automatically added to all the pages of your site. 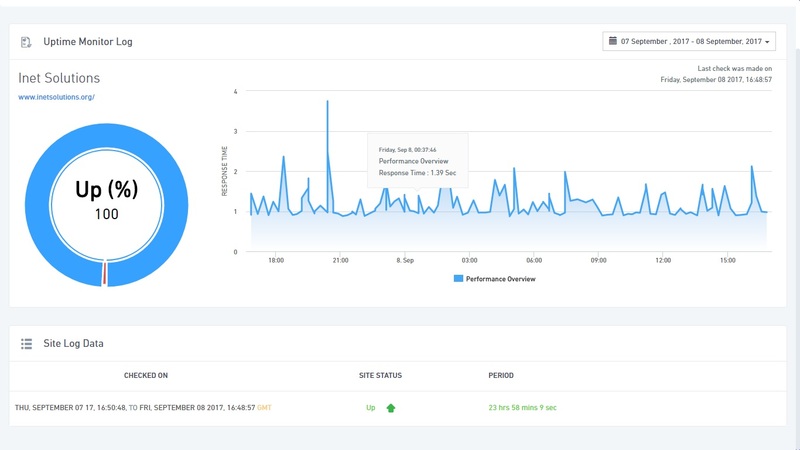 The next tool here simply monitors the uptime of a website during the last 24 hours. Prolonged downtime can be extremely damaging to rankings and traffic, and consequently – income. Checking if one website is down or not might sound simple, but when you consider this needs to be done every so often and for multiple websites, the task becomes rather complicated. With the “Uptime Monitor” tool, you get a notification every time one of the websites you are tracking goes off. Adding a site to track happens through the “Site Manager” projects again. 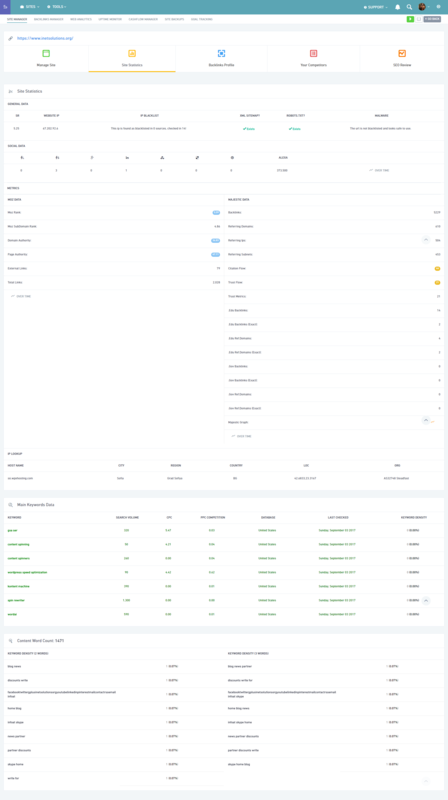 In the “Currently Monitored” section, you get information about global uptime, information about the last 24 hours for each site, as well as a full uptime report through the “view” button next to each entry. Finally, to edit the notification settings, go to the ‘Email & Alerts’ tab in your profile. Limit of 25 sites in total. Limit of 100 sites in total. This tool allows you to keep track of and manage your sites finances. It breaks down all of your projects income, expenses, assets and debts into each niche site or client. To do so, just add the site of your choice from the “Site Manager.” Once done, you can start setting up the information you want displayed. You will find income and expenses in the “Cashflow” tab, assets and debts in the “Assets and Debts” tab, graphs and statistics in the “Statistics” tab and finally, for an overview of your finances, go to the “Overview” tab. There are no limitations on this tool. There’s not that much to say about this tool really. It does exactly what the name suggests. The “Site Backup” tool allows you to automatically backup your websites, so you don’t accidentally lose your data. Backups are stored on Amazon S3 servers, which are highly reliable, very secure and super fast. Simply fill out the form above ( double check to make sure all the info is correct ) and you are good to go. 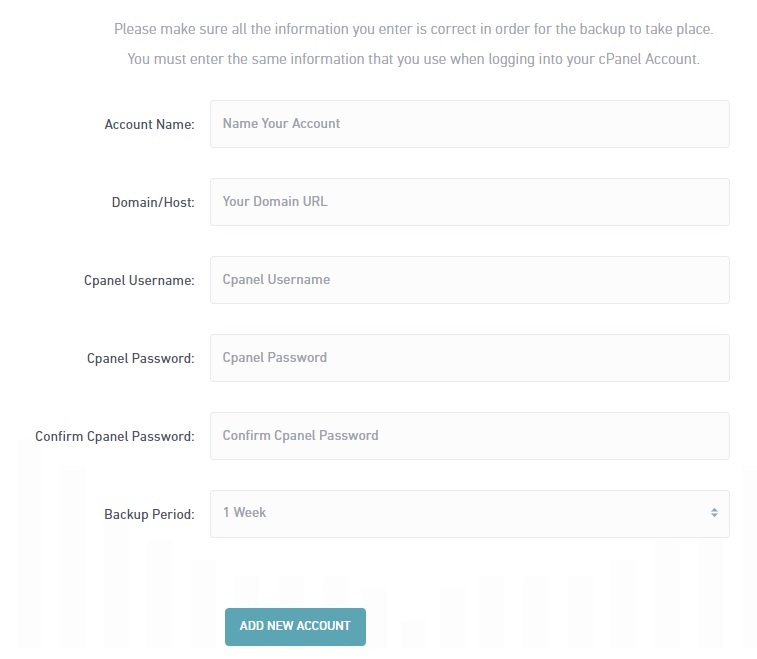 The tool will back up your site immediately, and you will be able to download any of the backups at any time. Limit of 1GB of space. Limit of 5GB of space. This is the last entry in the “Site Management” tools. 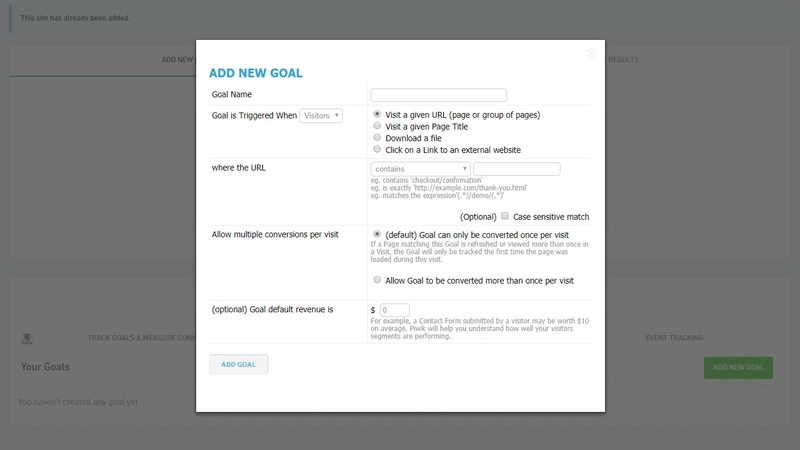 You can use it to set and track goals related to your website. Things like number of searches, the keywords and links that bring in the biggest amount of visitors, ad traffic, etc..
Track goals and measure conventions. The default option is the first one. To begin, click the ‘add new goal’ button and you will get this pop-up window. As you can see, the options are easy to understand, and most of them come with an example underneath. 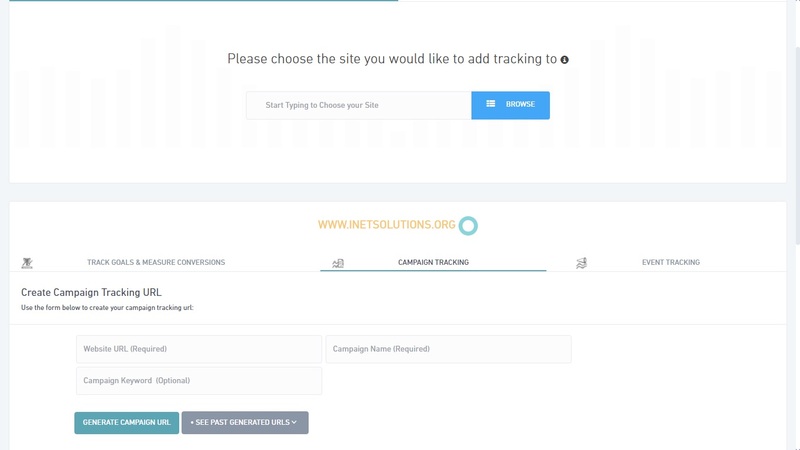 The “Campaign Tracking” option is used when you are promoting your website on other sites. 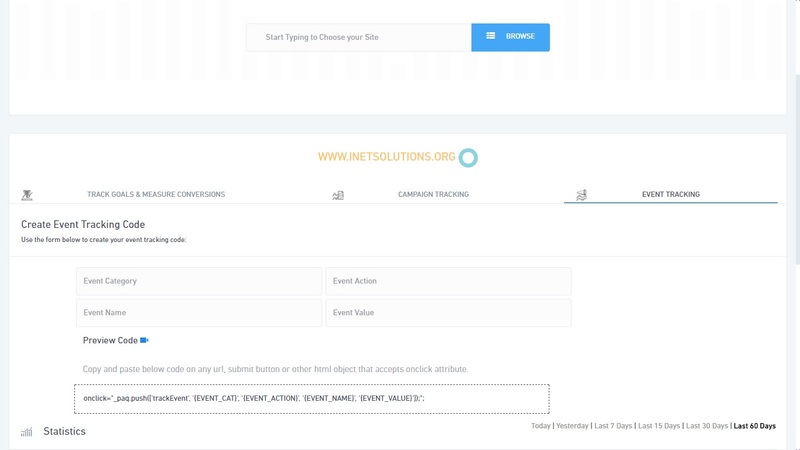 Simply enter the website URL, then give the campaign a name and a keyword. After you start promoting that website, you will be able to see the results here in the tool; things like how many actions per visit, average time on site and bounce rate. Finally, the “Event tracking” option allows you to track when buttons on your website get clicked. When you fill in the required info, the tool will generate a piece of code you need to copy inside features that have the “onclick” attribute. Although there are only two tools under this category, they are pretty powerful ones and allow for a lot of creativity. With these, you interact directly with other users of the site, either requesting or performing tasks for them. Both tools work on the same credit-based system as the other features of SERPed, however, by performing tasks for other customers, you can earn credits directly into your account. The first tool acts as a marketplace for performing tasks. Using credits from your account, you can pay other people and have them perform various actions for you in order to reach your SEO goals faster. When you start the tool, you will immediately see an ‘Add a New Task’ button on the right-hand side. You will get a new pop-up with a good variety of options to customize your new task. First things first, you can start creating a new task, or you can choose another from the ones you’ve already created and edit it. After that, start filling in the fields provided with a title and a description. And remember, the clearer the description, the easier it is for other people to pick up the task. As you can see, the tool allows for a lot of customization: you get to edit things like action type, time to complete, how much credits you want to award people for completing your task, and you can even ask for a screenshot for proof. 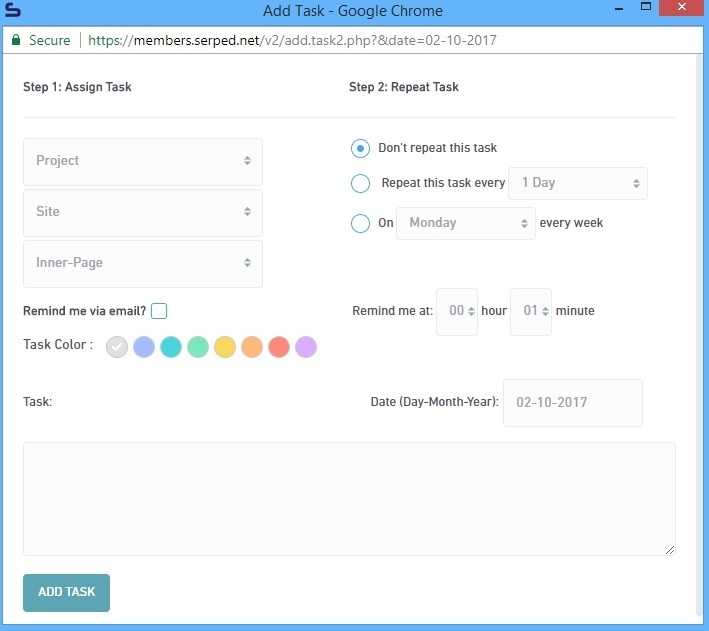 When you add the task, you will be able to see a lot of tabs such as total actions, actions left, action type, points per action, action complete time and status. You also have threads with persons who have started your task. Finally, the tool loads with all available tasks by default. In here, you can see all tasks people have listed, and you can start doing them. Simply click the “view tasks” button under the “action” column, and you will get an option to add the task, along with a description of what is expected of you. You start off with 10 credits, but you can earn as many as you want for spending later. The second tool connects your site with quality writers employed under SERPed. What this means is that you will get high-quality content published automatically on a set date. When you first start using the tool, you will have to set up a subscription. Here, you can choose how many articles you want per month, the length of those articles, and whether it will be standard or premium. When you’re done, you will get the cost for each article, based on your set requirements. Payment for these is done through PayPal. The next set of tools provides a powerful way to track rankings according to different keywords and parameters. Some of these include tracking globally, by city, or in more popular social websites. This tool basically allows you to track the rankings of your websites in a specific city in Google. You should already know by now that keeping track of your rankings is important, but what’s equally important is keeping track of those rankings, in the geographical area you are focusing on. When you first start the tool, you will have to pick a project from the ones you have already created previously. Alternatively, the tool gives you the functionality to create a new one with it. Then you can fire it off by entering the keywords you are currently working on. Simply click ‘Add new keywords,’ and you will get a pop-up window with several fields to fill out. After a bit of a wait – usually between 15 min to an hour, you will get to the home page of the tool with your results (as shown above ). The tool will provide you with an overview of your rankings, as well as graphs to track progress over time. Limit of 2500 credits to work with. 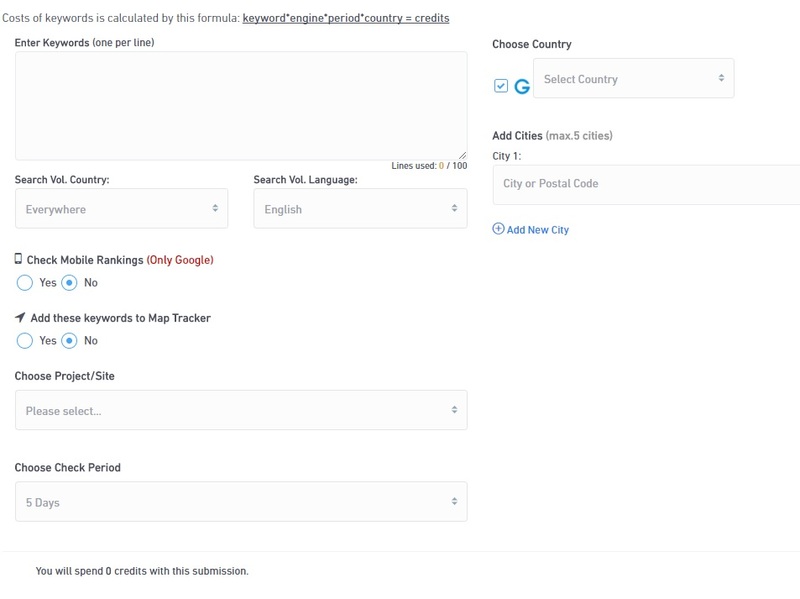 The “Global Tracking” tool functions similarly to the previous one, but instead of focusing on specific cities, you can do that for countries in Google, Yahoo!, and Bing. When you start adding in new keywords, you get a familiar pop-up form once again. Options here are the same as with the “Local Tracking” tool, except that you can add up to five countries and chose the preferred search engine (or all of them). Clicking on the keyword ( or alternatively on the “view” button ) will load a nice chart over time and for each country. You can choose the time period and you can also add or remove admin notes as well. Much like before, you also get an overview of the rankings as well as graphs of over-time changes. Search volume shows how many people search for the keyword in a month. You can also select competition analyzer which launches a pop-up that will show you all the analysis of the top 10. Limit of 1000 credits to work with. 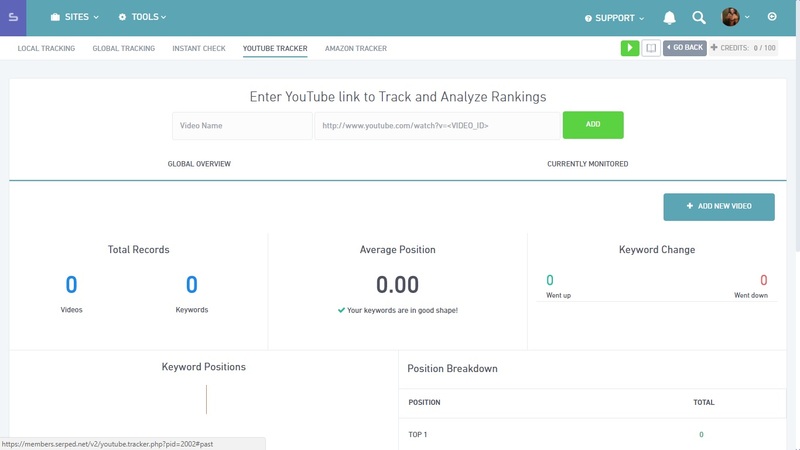 The second-to-last tool helps you easily track the rankings of your or your clients/competitors YouTube videos. As you can see, using it has been made rather straightforward. Clicking the “Add new video” button will make the search bar appear on top. After that, you must only enter a name and video link, and you are good to go. You will be able to see useful statistics like views, likes and more, as well as graphs so you can track progress over time. This should give you a good idea if your videos need proper optimization as well. In the search results under each video, you will be able to see where inside the YouTube search engine the keywords rank and how many terms you are tracking with their corresponding position. You can also see how many Facebook likes they have. Limit of 100 credits to work with. 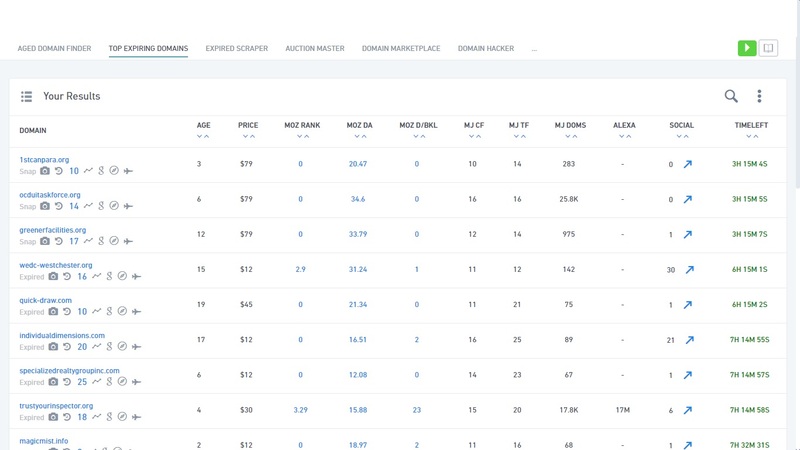 Finally, the “Amazon Tracker” tool will pull rankings and statistics for a specific product and category of your choice. Amazon utilizes its own search engine, so keeping an eye on that might be useful if you plan on starting a business with it. Using the tool is extremely easy since the interface for adding new products is really simplified. 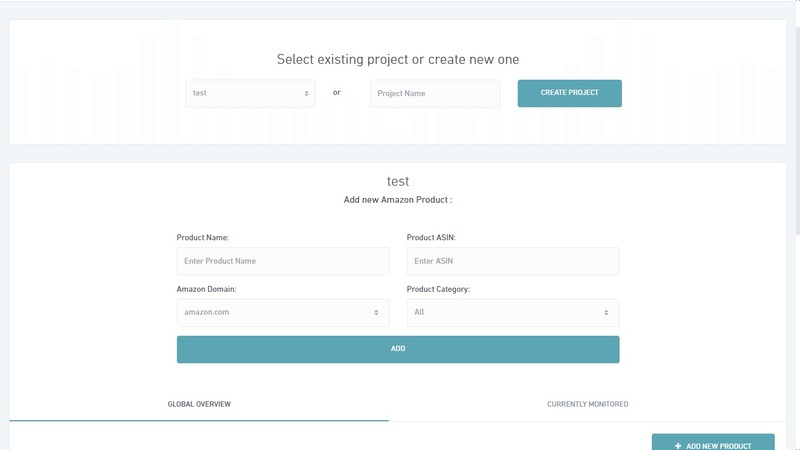 Just give your new search project a name and then simply enter the ASIN of the product, the product name, the Amazon store you’d like to use and the category. The results will show the first 100 matches and the item image, title, category, sales rank and manufacturer for each one. This small package of tools is perfect for finding and keeping contact with new and potential clients. The value of the “Client Acquisition” tools grows even more so if you are focusing on SEO. The first tool on our list helps you find new client leads and brings new business to your SEO company. To be more specific, it creates an extremely functional audit report, filled to the brim with your company branding. You can embed the piece of code you get from this tool on your website, and your visitors can start using it right away. First off, chose or add a company profile. The option to create a new profile is on the same page, so you don’t need to look around the different tabs. Secondly, you can customize the functionality of your report. You can fiddle with things like language, content, and background. You can also change the maximum number of reports per e-mail. Finally, you can write a summary to show up on the report and whether the tool should include recommended tasks. Next, you can customize your optin form and e-mail settings. On the optin side, you can choose the information you want to collect and edit the fields for that information. You can also add a custom ‘Thank you’ page if you want to. On the e-mail side, you can edit your main e-mail settings or change the e-mail body and content. Finally, in the “Embed Code” section, you will get two types of embed codes that you can insert on your website: the Box Embed Code and Landing Page Embed Code. Both of those are described in detail in the tab itself. Limit of 500 leads found monthly. Limit of 5000 leads found. The “Citation Scanner” is a very powerful and fast search tool for citation opportunities. It can find the position of either a business or a keyword in local listings. To use the tool, first select the type of search – business or keyword. Then, fill out the form, select the categories you’d like to see and you are good to go. You will get a notification once the search is complete. 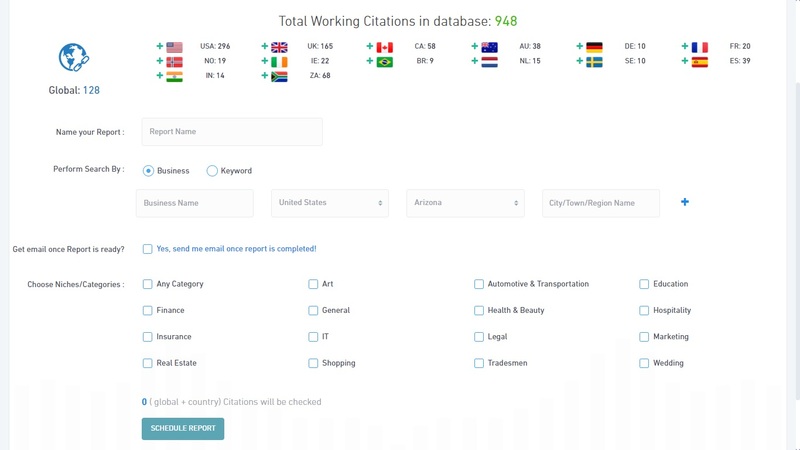 In the report you will see a list of websites currently ranking for the keyword you chose, as well as their addresses and citations. 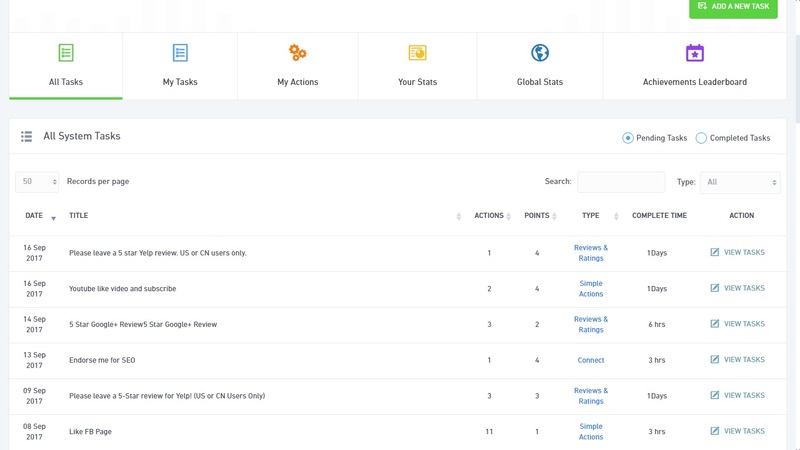 The “View Results” option in the “Actions” column allows you to see a selection of directories these keywords can be listed in, as well as their metrics. Monthly limit is 25 searches. Monthly limit is 250 searches. 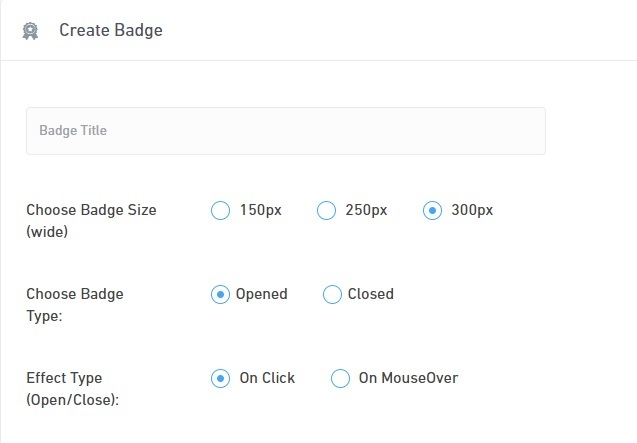 This tool simply lets you design a badge, which you can then send to your customers and have them leave reviews. To begin, name your badge and configure its dimensions and type. Next, you can add the citations to display on the badge by loading them from the “Citation Scanner” tool. You can also add links to your social network profiles and edit how the header and footer look. Finally, there is a preview window on the top of the page, where you can easily see what each option does. The final tool in the “Client Acquisition” section helps you find and contact clients, whose sites aren’t optimized for mobile use. This is really important since Google no longer ranks sites that don’t have a mobile version on mobile searches. The tool offers you two ways to find new clients: you can use a keyword to browse through Google’s database or enter specific urls ( up to 50 ) if you already know their sites are not mobile-friendly. When you get the report, you will be able to see which sites passed and which did not. From here, you can also get their who-is information and how their site looks on a mobile device. Once you have compiled a list of such websites, you can bulk e-mail them and offer them your services directly from the tool. Monthly limit is 15 searches. Monthly limit is 150 searches. In here you will find a wide selection of tools that help generally improve the quality of your website, be it either indexing backlinks, proof checking or managing content. With this, you can send your links to the best link-indexing services out there ( including the SERPed indexer ). This tool is as powerful as it is efficient because using it has been made so simple. Everything you need to know is displayed on the homepage ( screenshot below ). Just enter the backlinks you want indexed ( preferably tier 1’s and 2’s ) one per line, choose the service you want to use and you are ready to go. You can use the SERPed indexer free of charge with this tool, or if you have an account with any of the other services, you can enter your information here and use them instead. Finally, the “history” tab displays all submitted links. You can see them here or download a file with all of them formatted. Daily limit is 125 links. Monthly limit is 500 links. Monthly limit is 2000 links. Another simple-to-use tool. It does precisely what the name implies: checks whether your links are indexed in Google or not. There are two main reasons you will want to use this tool over doing that manually. First off, when you do it yourself, you are very likely to get your IP blocked by Google or at least leave a breadcrumb trail back to your main site. Secondly, this tool saves you the trouble of going through proxies, since it automatically employs the numerous proxies at SERPed’s disposal. 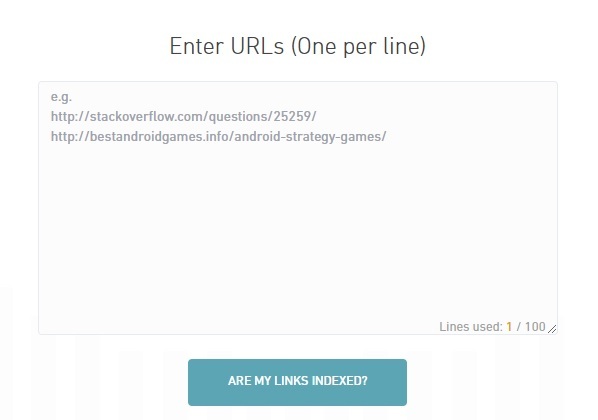 All you need to do is enter your urls in the given field ( again, one per line ) and click the “are my links indexed?” button. This process is completely safe, and you will immediately get a report with which links are indexed and which are not. After that, you can just use the “Link Indexer Pro” tool for the ones that aren’t indexed. Daily limit is 200 searches. Monthly limit is 2000 searches. Monthly limit is 5000 searches. This tool takes a text input in spintax format and checks if there are any errors with the spintax. It displays opening and closing brackets, as well as any errors in the text, while also checking for uniqueness. To use it, just paste your text in the “Enter Spintax” field and click the “Check Your Spintax” button. If there is an error, it will be highlighted in red. Fix it and check your spintax again, until it’s error-free. The “Preview” section on the bottom is where you can see the number of opening and closing brackets, as well as the uniqueness rate. The “Grammar checker” tool works perfectly with the “Spintax Checker” tool. After you have fixed any errors in the spintax, you can just copy the text here. This will fix any grammatical errors as well as misspellings. The text doesn’t have to be in spintax though; you can paste any article you have written ( or had someone write for you ), and it will immediately make sure there are no errors. You also have the option to run the text through Copyscape to ensure that it is of good enough quality and unique. To use it, simply paste your content in the field and click the “Check Now” button. If the tool finds anything wrong, it will underline it in red, and you can click the “Click to edit text” button to fix it. This tool pulls a large selection of content for your website from a given keyword and lets you pick and edit the precise thing you are looking for. You can get images and videos with it, as well as articles you can spin right away so that they pass Copyscape. You also have to option to enter your WordPress details and have the tool post your chosen articles directly to your blog. Once you have entered your keyword and selected the visual content you want ( as well as its position ) click the “Start getting content” button. You will get your results in a new page, with your results in different categories, as shown bellow. From here, you can edit the article and check it through the “Grammar Checker” tool, spin it or just pull images or videos. In the “History” tab you will find all your previous searches, and you will be able to use them again if you want to. The next tool allows you to securely manage and update your WordPress by downloading a plug-in and without ever having to log in the WordPress site. Not only is this save a lot of time, but also reduces security and downtime complications. The “Content Restorer” tool does several things for you. First off, it removes the version of your WordPress altogether, hindering attacks that target specific versions. It also allows you to post hyperlinks within the content. 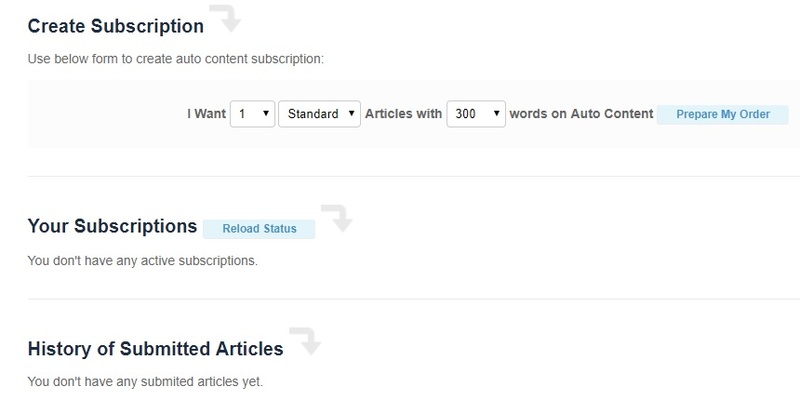 Finally, you can link your blog with SERPed and have the tool post content directly. Monthly limit is 10 uses. In the results, as shown above, you can analyze the internal link profile as a whole, or just each link in-depth. This allows to see its location, destination, anchor text, and if it’s dofollow or nofollow. And that ends the detailed review of each of SERPed’s 42 tools. Now, as I mentioned in the beginning, that is not all of SERPed’s functionality. There are some other perks that come with this SEO software that are extremely useful. Let me show you. In short, SERPed also provides you with a simple project/website structure to manage your, well, projects and websites as well as a task management and calendar functionality to schedule your work and branding, notifications, and team setup options. Let’s start with the websites management system. As you can see, for each website you have 5 tabs that show important data about it. Most of it is self-explanatory but I will mention anything that is out of order. On the “Manage Site” tab, you can see basic information about the website – hosting provider, registrar, Moz and Majestic metrics and a glimpse of social presence. SERPed Rank (SR) is a score that takes into consideration many different metrics in our own proprietary formula to provide something a bit different from Moz and Majestic. Rather than place the URL on a range of quality, we call our score the ‘Real Site Score’ and base it on if the site or URL had hard work put into it. Rather than having a scale of diminishing returns like the other data providers, we work on a basis of ‘is this site loved?’. A low score means the site is new, or was never taken care of. A higher score implies that the site had effort put into it. The scale is from 0 to 10 with a high score of around 9+ going to the bigger sites online, but not reserved just for the top 100 sites. Finally, there’s the “SEO Review” tab and what this does is an extremely in-depth SEO audit of the website. Below attached is an example audit of this website. And that’s it about the projects and websites management system of SERPed. Since, as you can see, SERPed is designed to be an all-in-one SEO solution, it is only fitting that it provides a way to organize your work. And this is where the notifications, tasks, and notes functionality come in. Quite simply what you are able to do with this is schedule tasks you have to do for certain days, get notified of events and write notes to remind yourself of relevant work. For instance, if you are managing many projects with many websites, it can be hard to remember for which one you have to do keyword research, backlinks analyses, etc. But with the power of the notifications, tasks, and notes provided by SERPed, those problems go away. The place where you can find them is at the top right of the main menu of SERPed right next to the search icon. Although all of these are mostly self-explanatory in what they can do, let me quickly show you a glimpse of each one so you can see for yourself. As you can see, you can customize each task quite a lot including selecting a certain color for it. This provides you with the chance of further easing your work on many projects and websites by assigning a certain color to each project/website. The rest of the fields are all standard and of course at the bottom is the textarea where you can write what you or your team are supposed to do. Oh yes, I said team because SERPed allows you to create accounts for other people with certain privileges, but more on that in a second. This further allows you to manage your projects and websites easier. This window allows you to add and view notes about certain projects, websites, and/or inner pages. The last thing that this amazing SEO toolset provides for you is management for your company profiles and teams. Both of these menus can be found under your profile. Let’s start with companies management. All of the details which you see in the table at the bottom can be added to your reports. Rest is pretty self-explanatory. So if you want a certain person to do only keyword research for you, then you simply give them no access to all tools except for the ones in the “Keyword Research” group. A powerful plugin for your WP site with many awesome functions including: Add web analytics to your site in a click, add a “Site Auditor Pro” widget anywhere you like, add new inner pages to “Site Manager” & other tools in a click as well as inner link your keywords and affiliate links with our auto replace function. Plugin also allows you to tick a few buttons and ensure all future versions of WP and plugins are updated for better security! 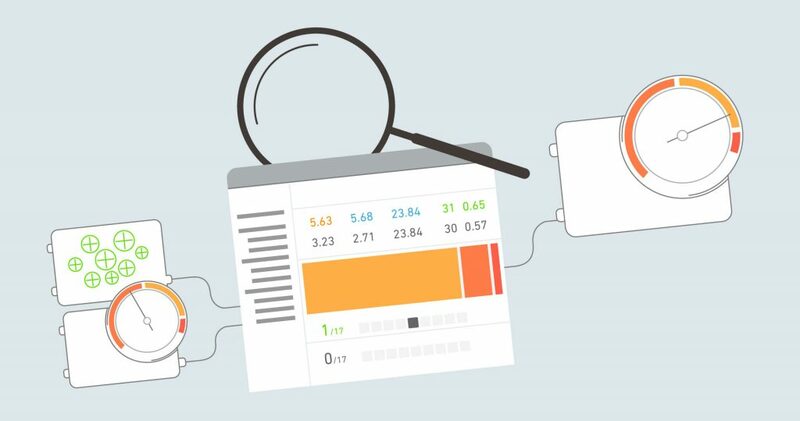 Get in depth metrics on Any URL with 1 click inside your browser. Check what keywords that URL ranks for, analyze any keyword in “Keyword Analyzer” and also add any backlink into “Backlinks Manager” in a couple of clicks, without leaving your browser. Quickly & easily send any URL to “Site Explorer” as well as access your favourite tools. Also when searching Google, in a click see the search volume and competition for that term as well as top 10 sites metrics! And with that, we pretty much put a close to what SERPed provides for you. Now let’s summarize this in a short, but honest review. Premium Plan – $79 per month. Ultimate Plan – $179 per month. So, our review? I think I’ve already expressed that one way or another but if I had to say it out load, here it is. SERPed is currently the best all-in-one SEO & digital marketing solution (by far) both in terms of functionality provide and in terms of price. My only concerns with the tool as it was while I was testing it for this SERPed tutorial and review is that since a lot of people are using it and I guess are growing rapidly, sometimes, the servers tend to lag a bit so watch out for that. But, they usually stabilize within a few minutes. So, if you, like many people doing SEO, are fed up with overpriced services and products, and you are looking to significantly lower your monthly subscription costs, then definitely give SERPed a try. Purchases are currently closed to the public but via this link, you will be able to gain access to SERPed. Use it wisely. So there you have it. I think that you can now see why I said “the only SEO tool you will ever need” in the title. I mean, SERPed is literally the definition of a paradise for anyone dealing with search engine optimization. Surely there is some functionality that is missing from it because after all, SEO is constantly evolving as newer and newer tools emerge. However, all of the fundamentals of search engine optimization are covered by SERPed’s tools – and much much more as you saw for yourself. In the end, it all comes down to functionality, need, personal preference, and cost-effectiveness. But, if you are serious about SEO and you want to get the absolute best bang for the buck, then you simply can’t go wrong with SERPed.